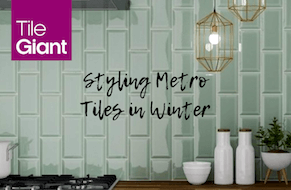 Following on from the fantastic response we’ve had to the original launch, we’ve now added a whole new range of other shades to our selection of our ever popular Metro tiles. 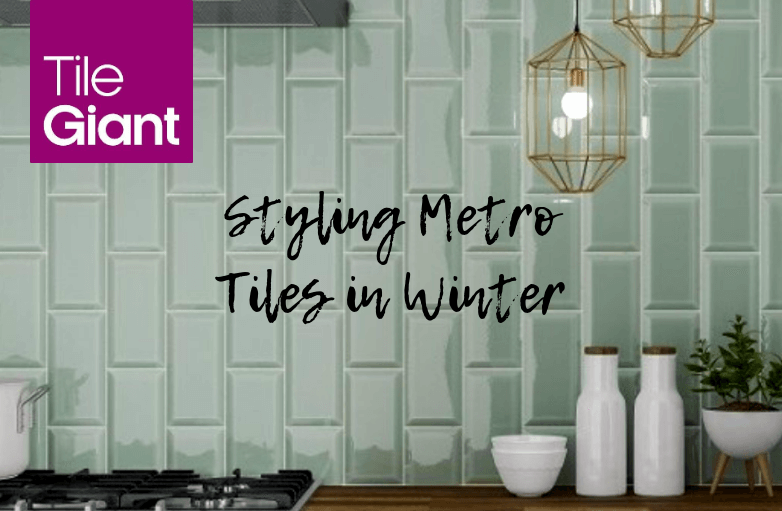 Here you’ll see 5 ways to style these new subway-style tiles, specifically to banish winter blues by embracing the season’s cool-toned colour palette. From a mix of soft pastel shades, delicate silver marble and bold sapphire, there’s a colour to suit every taste and every room without making your home feel frosty this winter. First on the list is our Midnight Blue tile. An impressive glazed tile that will compliment any bathroom or kitchen. Its gloss finish gives it a contemporary touch which, when laid in the classic subway-style and paired with urban decor, makes it a modern-day dream. 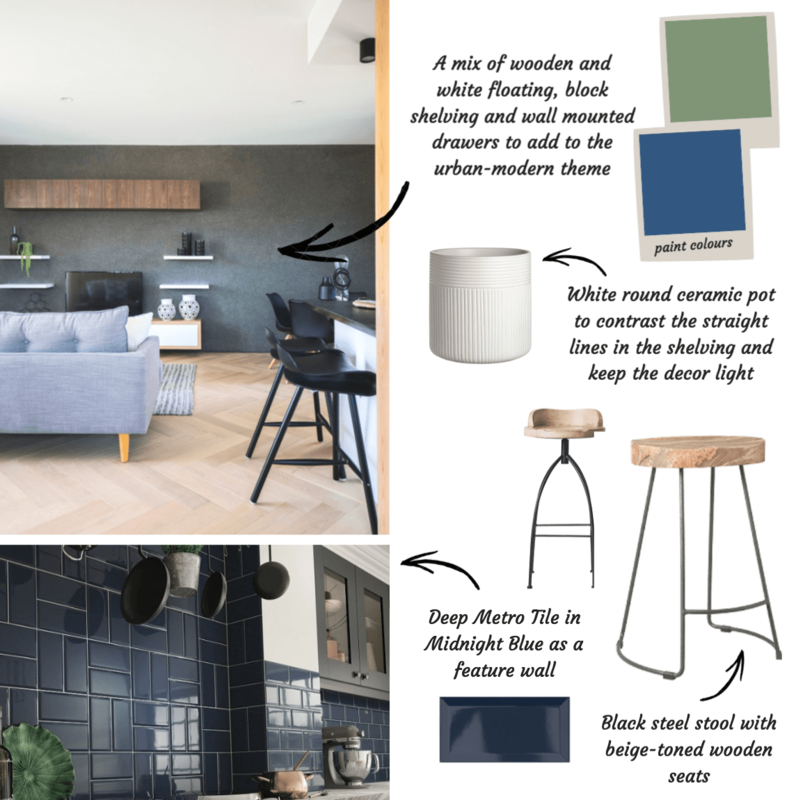 Although these midnight blue shades are often dreaded for their relation to dark winter nights, here you can see with the light, urban decor and minimising the tiles to a single feature wall, you can create a colourful, contemporary kitchen-lounge. Tip: This works particularly well when mixing a kitchen with a lounge, perhaps in a flat or open plan home. The Midnight Blue tile is composed of calming tones and when paired with warm, wooden flooring it creates a harmonious haven to retreat to. With winter comes dark, grey skies often from a mix of the shorter nights and the poor wet weather. However, taking inspiration from this we suggest adding our Metro Silver Marble tile to your space, to give your home an edgy look. 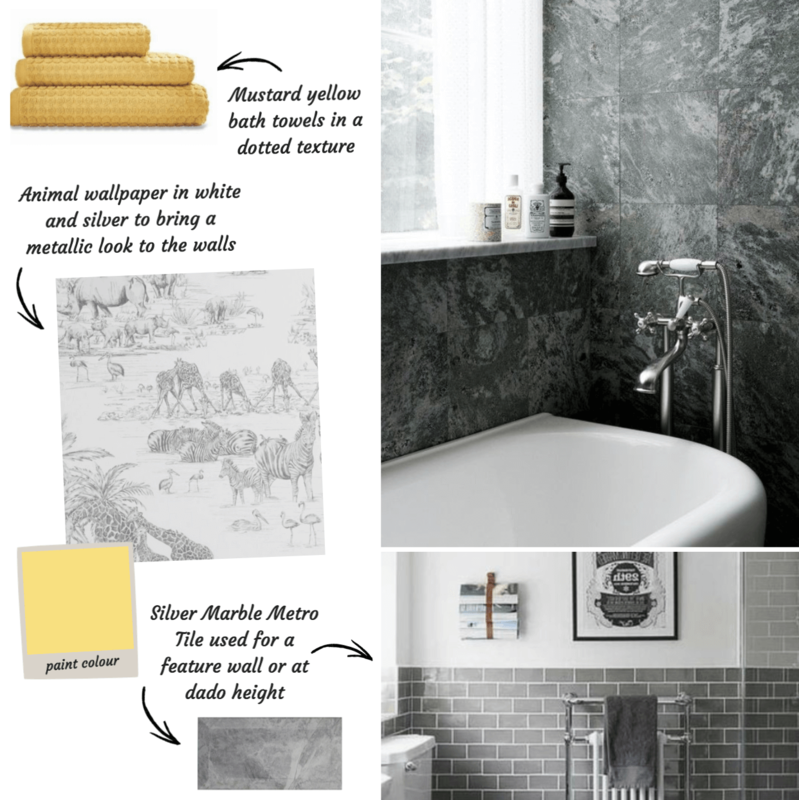 This works particularly well if you’re decorating a hip flat, bar or looking to enhance a bathroom. Laying these Silver Marble tiles in a Herringbone pattern will help to give your room flare and personality, making it feel instantly warmer whilst keeping to the luxurious, polished-silver tones. Combine with graphical wallpaper, fluffy rugs and an accent colour such as mustard or duck egg blue. These should be then brought into the room through cushions, blankets and other accessories to neatly tie the room together. Though it may feel risky, adding blue to your home could be just the key to banishing winter blues from your home. For best results, we recommend doing so in an elegant style room. 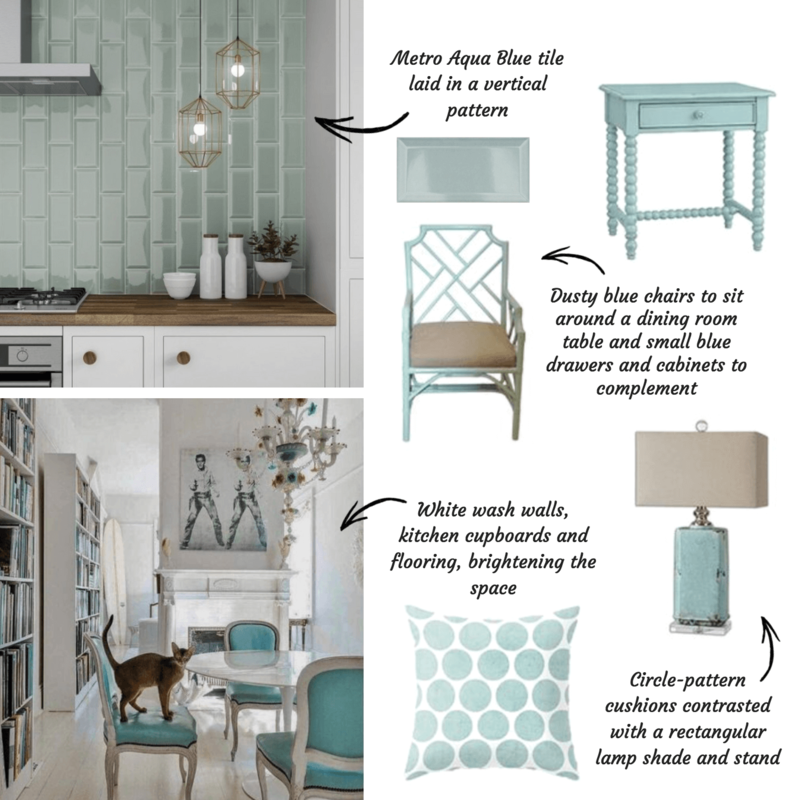 Choose a bright, sea blue such as teal or aquamarine and pair with white, detailed furniture giving your home a French feel. This will also bring an extra flair of sophistication to your home. Add in elegant room features such as a chandelier, a floor to ceiling bookshelf and contemporary wall art in white to fill the space without creating an extreme contrast against the Aqua Metro tiles. Though a blanket of pure white snow is something many of us dream of during the Christmas period, it can feel extra cold during the winter months, particularly when in a bathroom setting. So, to help counteract this, we’re suggesting swapping the trusted, bold white Metro tiles to venture into patterns. Our Carrara Metro Tile is a go-to choice if you’re wanting a white, neutral wall that’s a little different. 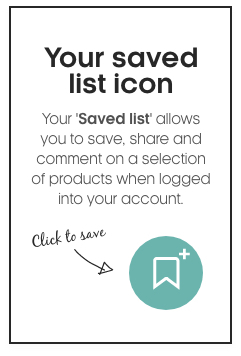 Use this on all walls within a bath or shower room, extending from floor to ceiling to ensure your walls are fully protected from accidental spills as well as helping to elongate the room and make a smaller bath space feel open and airy - minus the cold. 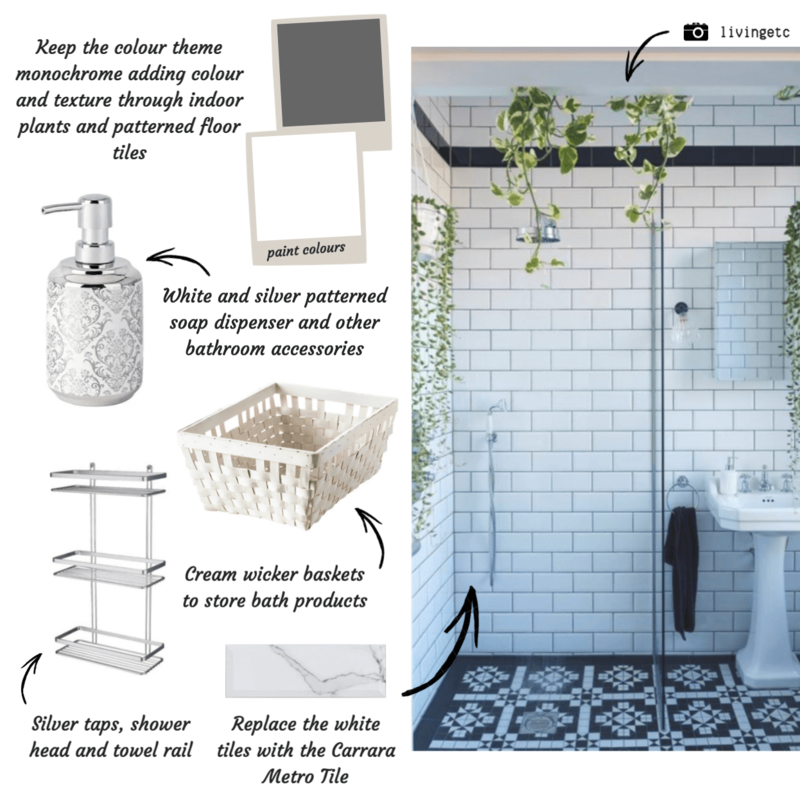 Style with monochrome patterned tiles to bring a Victorian feel to the floor and add creamy wicker baskets and indoor plants to bring the room to life. Tip: Opt for warmer coloured grout such as gold or an autumnal brown. Then, add in a fluffy bath rug and spotlights in the ceiling to give the room a yellow hue for extra warmth. Although black comes with connotations of being extremely dark and depressing, it’s also recognised to be a classic shade to bring sophistication to a room. 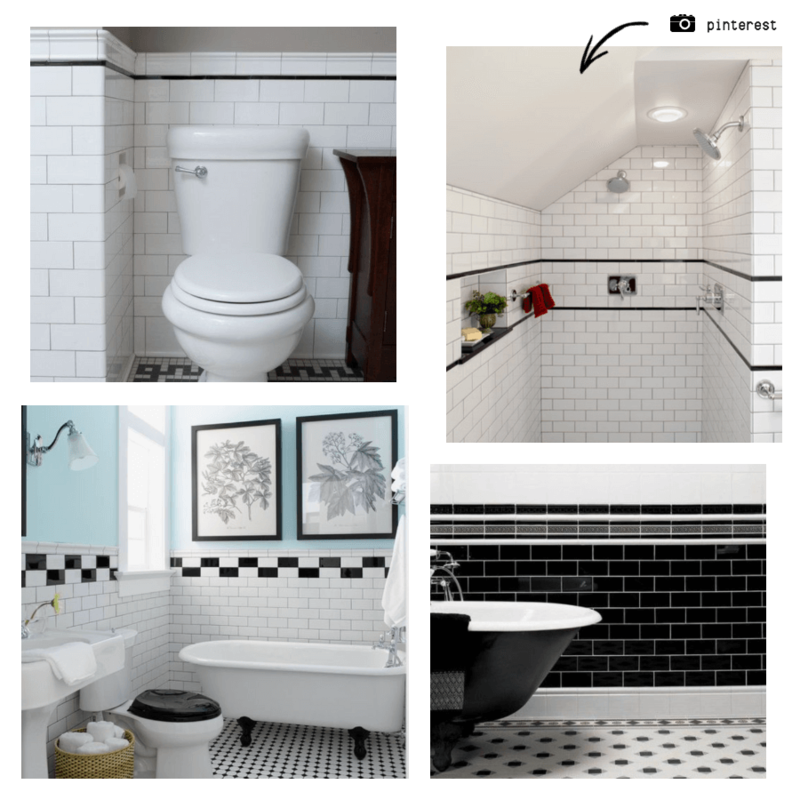 Below, we show how to make contrasts in a bathroom by using a strip of black tiles to create a border between objects and to split up sections of the wall. To do this, mix our Black Metro tiles with White Metro tiles for the monochrome look, or we suggest incorporating our Blush Metro Tiles to bring a hint of colour to the room. 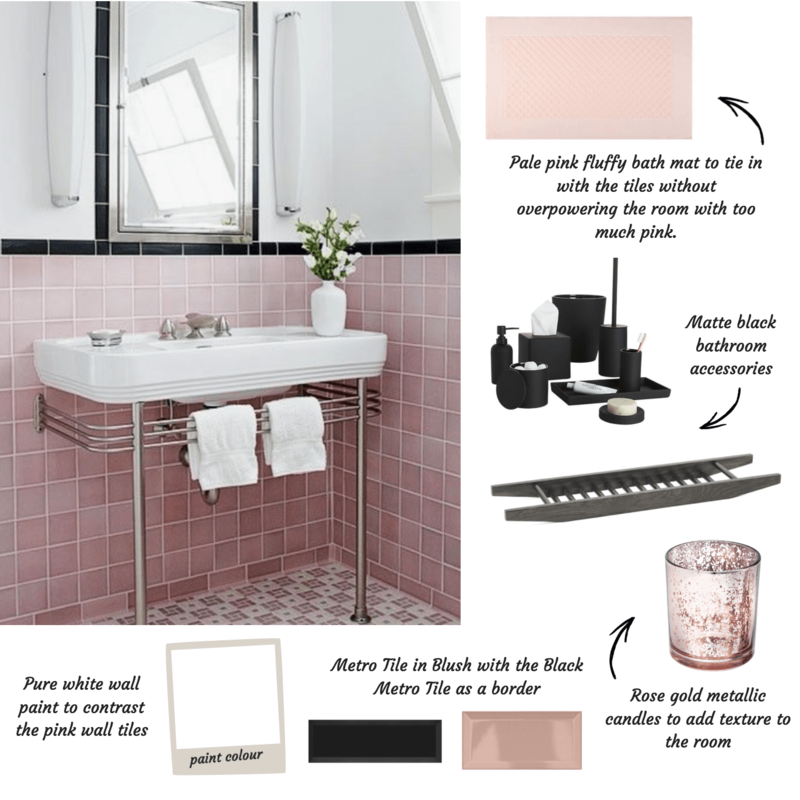 Style with a pale pink bath mat, rose gold candles and matte black smaller accessories. These will nicely contrast the glossy black Metro tiles and add another dimension to the room. We offer extremely competitive pricing on our entire range of tiles and likewise, these new additions to our range of Metro tiles are both competitive for retail and trade. Our stock is widely available in our 100+ showrooms which are open to browse at your leisure. Alternatively, if you’d prefer to shop Metro tiles online, we can supply you with samples delivered for free.